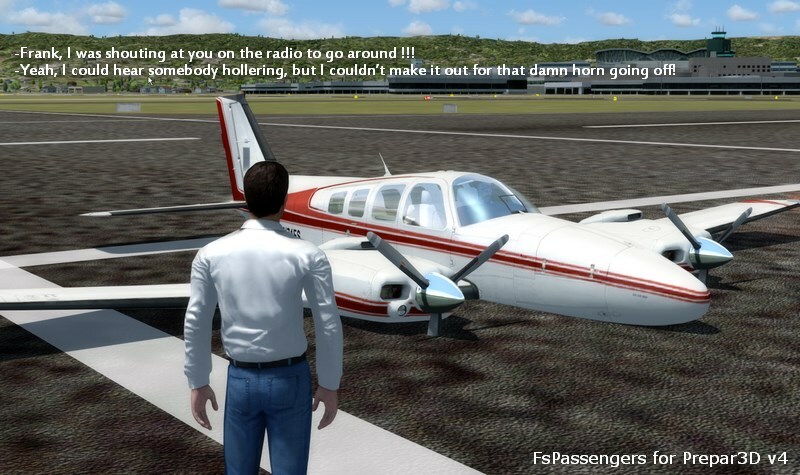 FsPassengers is an add-on that will completely revolutionize the way you fly in FSX/Prepar3D. 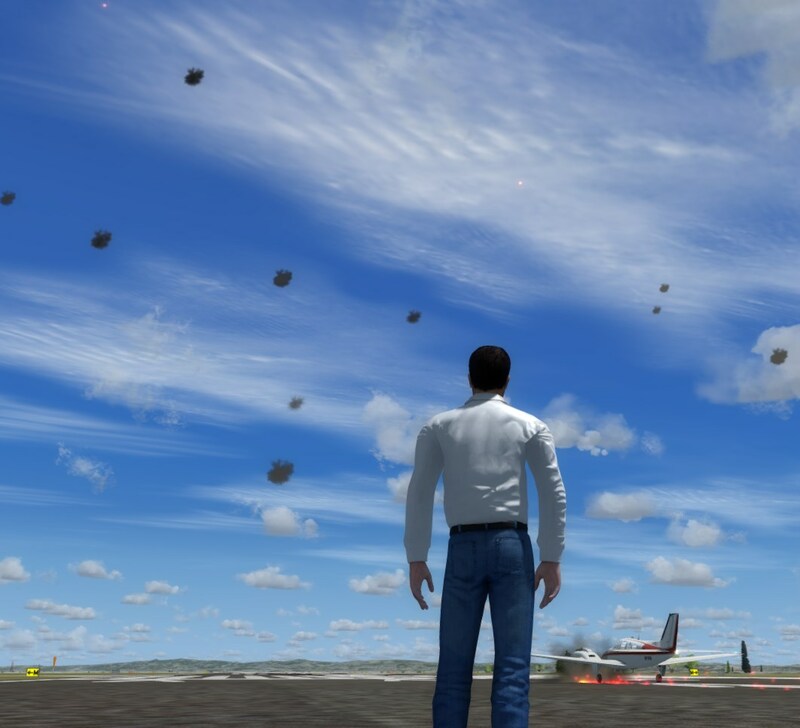 • You can continue your FsPassengers career (FSX or FS9) on this version. Flights Database is still compatible. 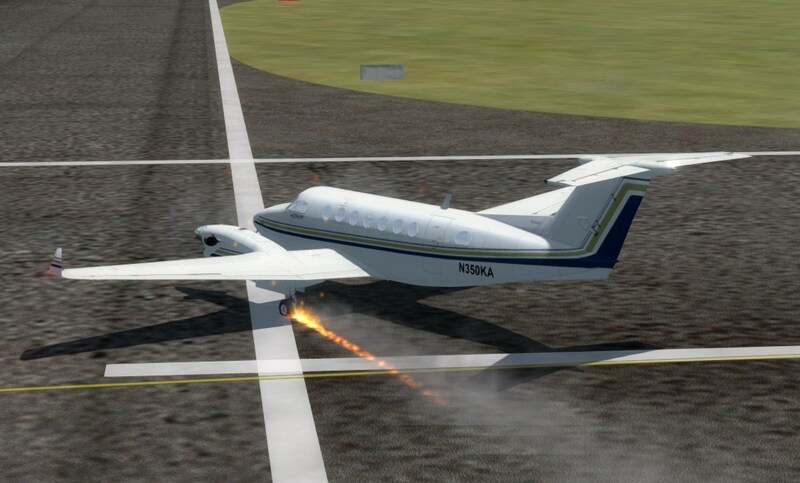 • If you have both Prepar3D v2 and V3 you can fly the same career on both. • Add passengers to your flights! Finally, you're not alone in the sky. • Passengers react to how you fly your plane. Hear them scream if you make drastic mistakes, and get their opinion of your flight in real time. • Provide in-flight passenger services such as movies, music, and drinks. • Make money for successful flights; be fined if you do something wrong. • Manage an airline (make money, manage aircraft fleets, etc). • Maintain your aircraft in good condition, otherwise you may experience unique and surprising failures. • Create and maintain pilot careers. 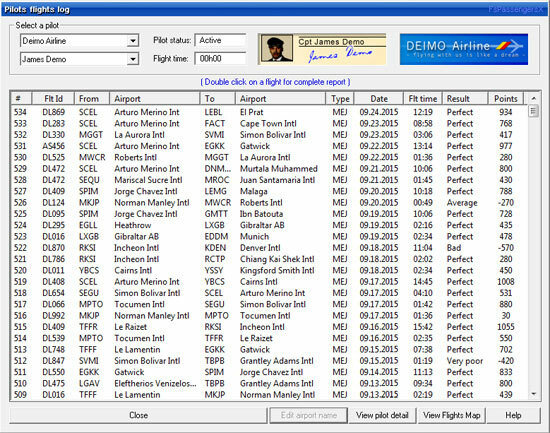 • Keep detailed logs and statistics for every flight you make (great for virtual airlines). • Attendants, passengers, effect; listen to ATC chatter, music, GPWS, and more. This add-on includes more than 1200 in-flight sounds to immerse you in the ambiance of flight. • 40 unique failures with visual effect (smoke, fire) and sounds. 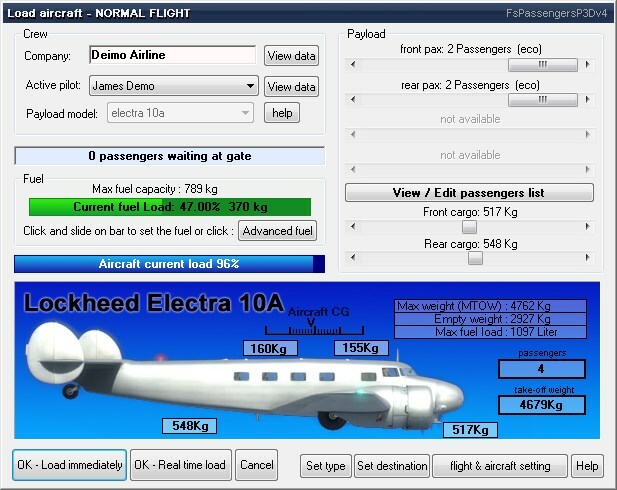 • Export your flight to your Virtual Airline. 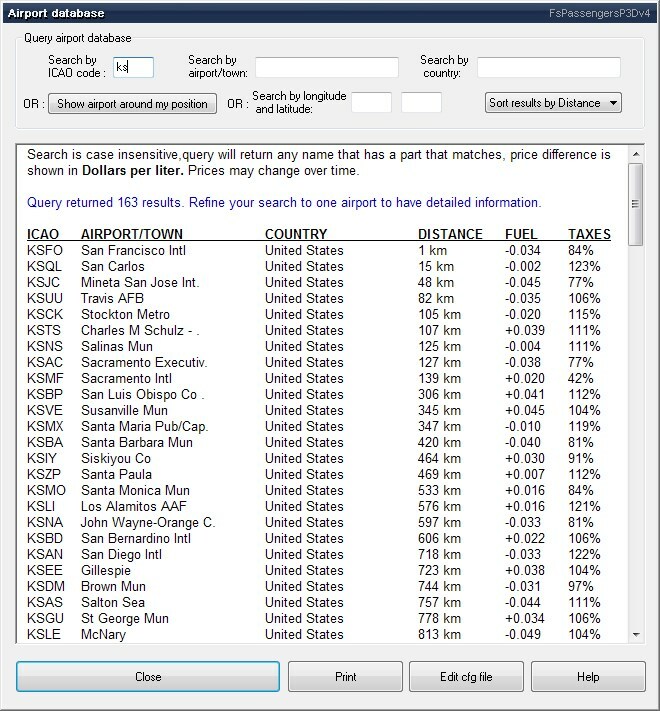 • All screens and reports work in full screen. No need to quit Prepar3D. • NO impact on frame rate and still simple to use ! no complicated learning curve. Release is still planned for spring, I hurry up, but I cannot really plan how much time take some problems. Why it takes so looong ? I'm deeply sorry for this delay. First thanks for all kind (and others Wink ) messages. Visually, there is not much to report but internally there were huge progress. The mini panel is now fully functional. A lot of other stuff & code were fixed but it's too technical to report here. 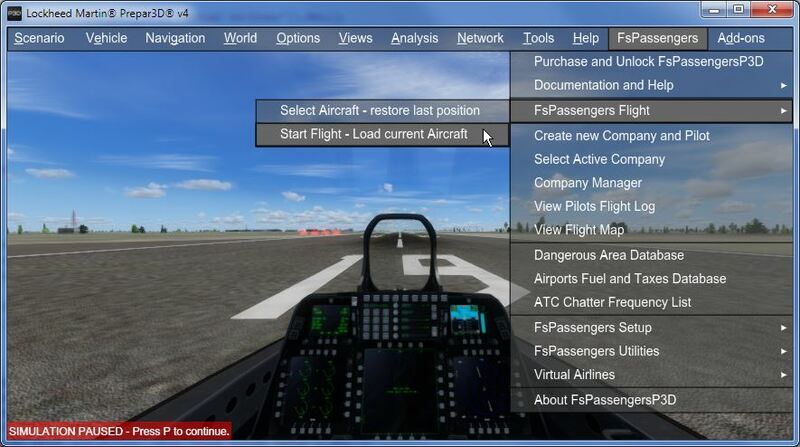 As promised you'll be able to continue your FsPassengers career (fs9, fsx, p3d v2 or v3) on P3d v4 version. I think I'll install FsPassengers for Prepar3D v2/v3 and v4 in the same directory "FsPassengersP3D"
and you have only one folder for flights database, payload models, sounds and customisation. This "hack" is very complicated, I should find all the wheels in memory (dynamic) to control them directly, find the contact point, copy them on my own memory, deallocate the original, change the original pointer to my memory and redefine new "contact" point with ground. I hope they didn't changed too much things for the V4 else it can take me several days (or worse). The first step is the direct control of the wheels (so I can block one or all in any position). Success (image below), and I cleaned the original code as well. There is a looong time that I think about allowing to purchase stuff to customize the interior of your aircraft. more comfortable seats, multimedia electronic, phone by sat, cabin decoration etc. etc. You can then raise ticket price to payback/gain more money or choose to boost company's satisfaction. The main problem is the interface to purchase stuffs, it should be clear, simple and appealing but as I plan to redesign a bit the dialogues it might be time to do it. What you think about this idea ? 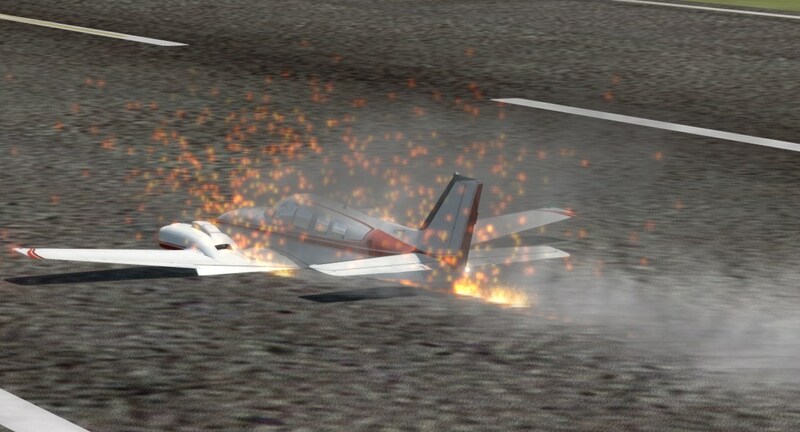 Anyway, I checked carefully the "belly landing code", seems ok now. I'm also done yet with the "Tire explosion at landing". I made a utility to grab all the ICAO/airport from BGL for FsPassengers's configuration file but I don't have any scenery addon in my Prepar3D. Yet it find 24502 airports. You can try it if you want, if you have a better list maybe we can use it for v4 ? 1-unzip the exe in "Prepar3D/scenery"
3-Launch... list is created next to the program, you can delete the files if you want. For those that watch often: I'm still working on BGL/GPS airport information as stated above. There is a lot of code to add/change but it will add a nice new feature in the first release of FsPassengersP3D v4. More info with screenshot within one/two days. 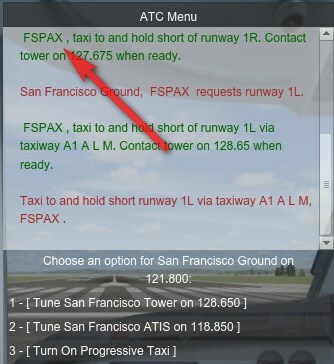 Will there likely be any difference to the UI Dan in the p3dv4 final version? As I'm late, the goal is first to make a quick release, so the basis will be *almost* the same. Once the first release done I'll continue to work and within one or two month there will be more features in updates. This said, the dialog are easy to modify, so yes, most of them will be modified for the first release. Bigger, cleaner, easier to use and with some news stuff. The last days are a perfect example of the difficulty to give a release date. On the other hand, sometime one might have some good surprises. Core, dialogues, documentation, utilities, text, language translations, beta test, bugs that may be revealed by test and various fix. I would say do not expect it before 2 month but stay tuned (or subscribe to this thread). Sorry mate, the list is not open yet. I don't want to maintain a list that might be outdated at test time. 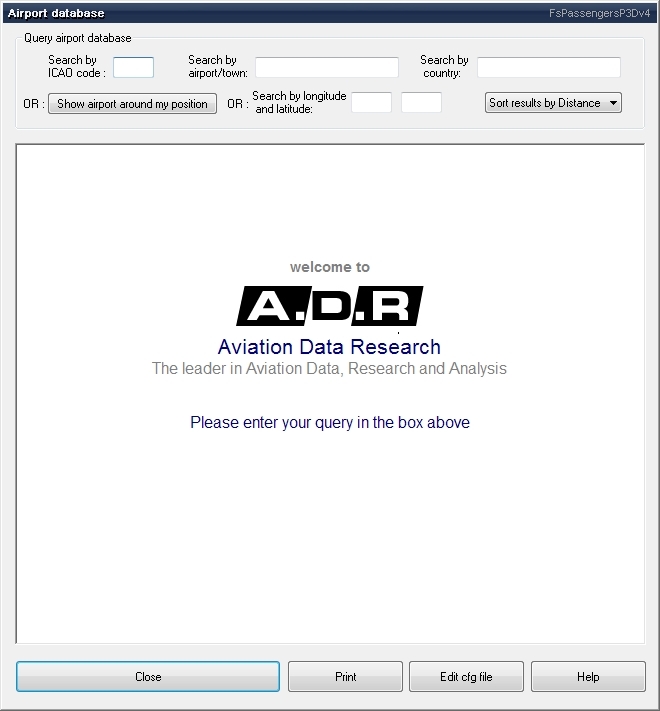 Presenting to you the new "Airport Database", new size, new search field, new button, new features. 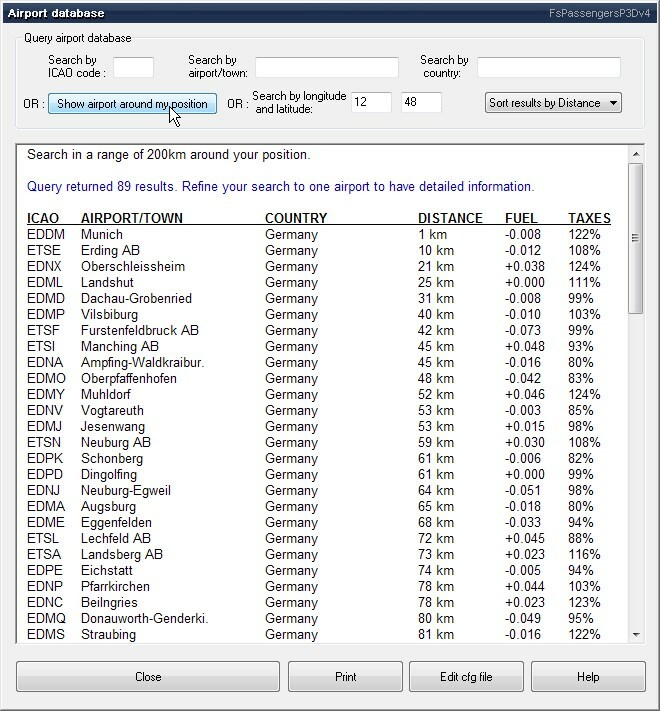 New information: the distance from your current location to the airport found, you can sort the list by ICAO, country, airport name or Distance. The display is still "light speed" fast, a search by any criteria take less than 100ms. New feature, the button "show airport around my position" that display all airport in a 200 km range, here sorted by distance. 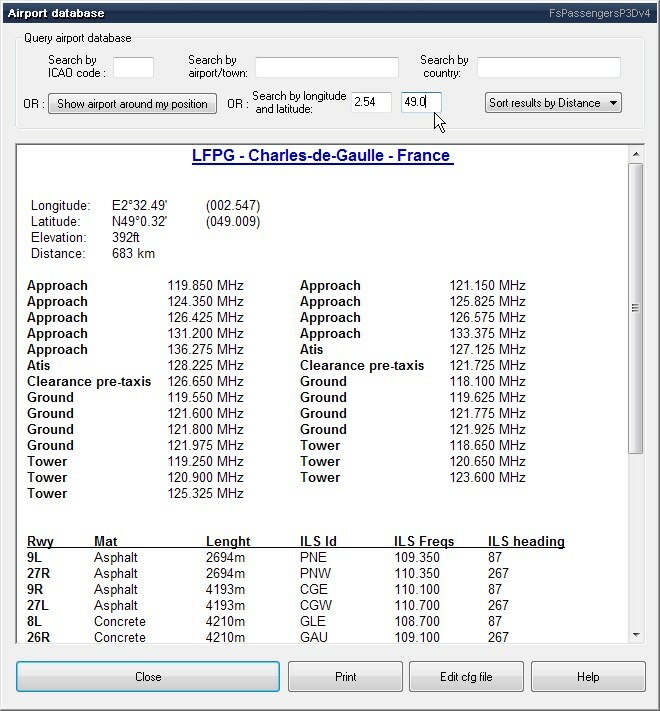 Position, altitude, com frequency, runway, surface and ILS etc. The database include by default all the 24500 airport of Prepar3D (Maybe much more if a tester have a lot of third party addon with more airports.) 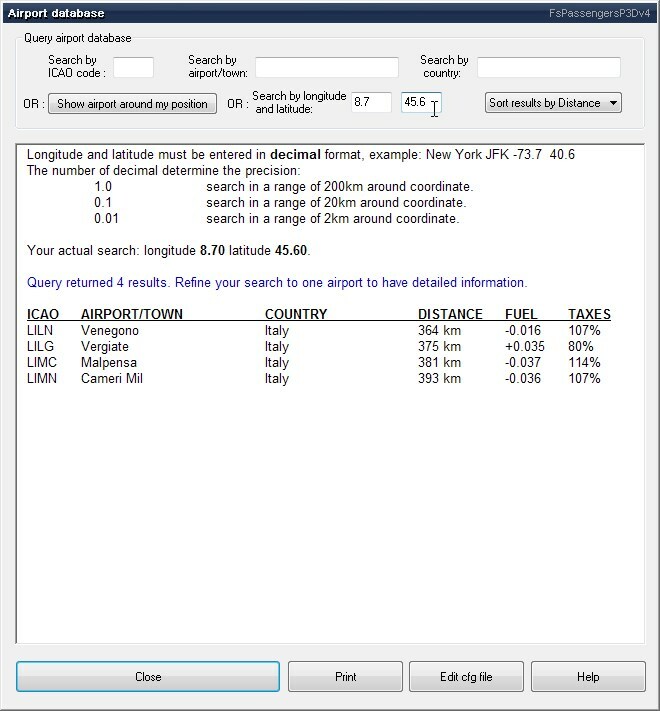 But if you add a scenery with an unknown airport, you'll need to refresh the database to include it. This utility available in the default installation will be present in menu and various place so it's easy to locate and launch. 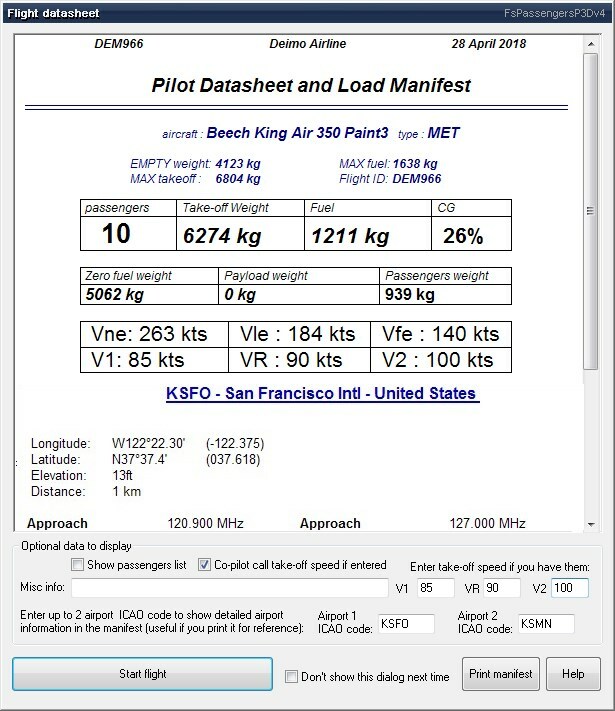 When you start a flight, you'll be able to enter up to two airport ICAO so you can print a manifest will all the required references. Notice: I just finished the display (5AM) it may not be perfect yet, you are welcome to make any remark or if you see a typo in the various text. I fixed the Airport database creator, I wait the feedback of Pedro to post the new version here also. I removed completely the Prepar3D GPS that was slow (>2 seconds sometime) and that I suspected to trigger some problems on some systems. 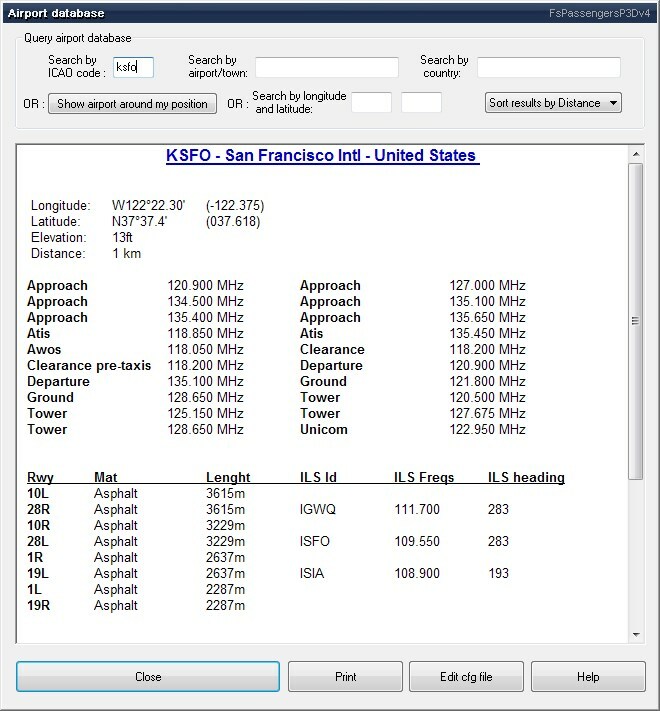 Now FsP use the new airport database which take less than 5ms to find an airport by location. After that I worked mainly on effects today, all are back including Flak, fuel leak, oil leak, engine fire, flak hit etc. etc. What's the purpose of war zone would some say ? First for the lulz of flying between explosions, being hit and manage damages. Second it's an excellent way to boost your pilot's career, if you land (or belly land) safely an aircraft with massive war damage you can gain as much as 3000 pilot points in one flight. It's better with sound and animation. Can you please test this tool (again) ? 4-Dont mind the warning about "missing FsPassengersP3D v4, click "yes"
5-Launch utility and report as above. An hard one: changing ATC calling sign (In FsPassengers it take your flight number as in reality). 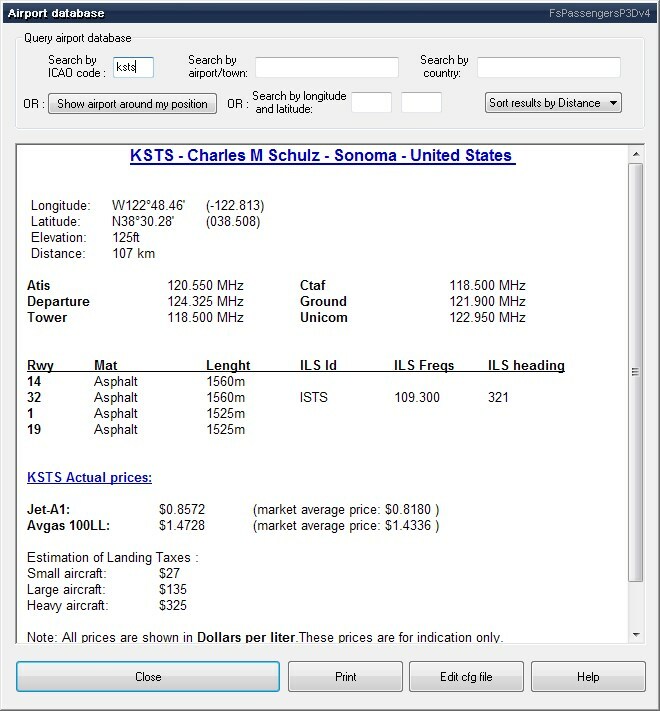 The possibilities to change the callsign exist with the SDK but none work since FSX, so one has to use a "different" way. With this latest one I think I have now back all the "specials" functions of FsPassengers like this one. I can do yet a complete FsPassengers flight with all the features but the final is not close to release. but it will pay on the long term and it should be done. After that I'll rework several dialogs, add some "simple" features and visual improvement (for the first release, more to come in future update). Then rework all the utilities for x64. Anyway I work day and night even the week-end without stop.